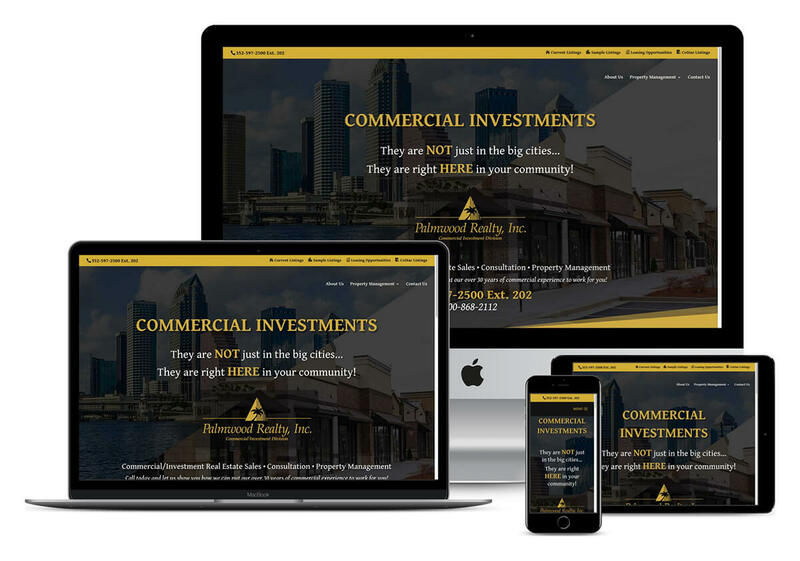 When you are in the real estate business, especially the commercial real estate industry, having an effective and modern website, that is easy for your potential buyers, sellers, and leasers to use, is more important now than ever. Real estate agents who invest in a good real estate website designer can reap the benefits when potential clients are shopping for homes or business properties. The marketing and sales strategies in the real estate industry have probably changed more than any other industry since the internet came into existence. 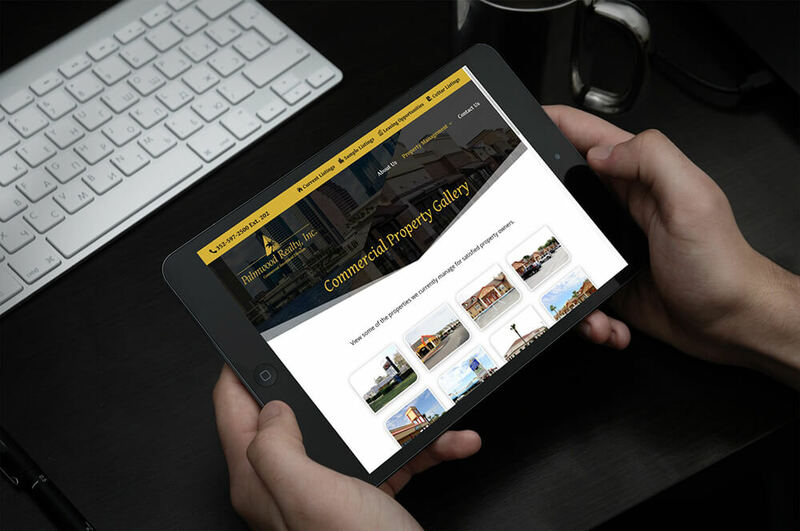 So, it’s important to choose a website design agency that understands these strategies behind a website design for a commercial real estate agency. Nora Kramer Designs was contacted, via a referral from another happy client of ours, by Palmwood Commercial Realty, Inc., a company with a strong history and reputation in the community it serves. They had a website that they had for years online. However, their real estate website wasn’t getting regular updates and still ran old Flash technology. Because it was running the dated Flash technology, it didn’t even load on popular iOS devices such as iPhones and iPads, and many desktop web browsers required additional software be installed to run it, rendering it almost useless to some of their potential website visitors. The website also looked extremely dated and it didn’t reflect the brand they had built for themselves in the community after the many years they had been in business. It lacked some important mobile-friendly aspects to it, as well. A mobile and responsive website is so important in 2018 because at least 50% of website visitors are coming to websites from mobile devices such as smartphones and tablets. 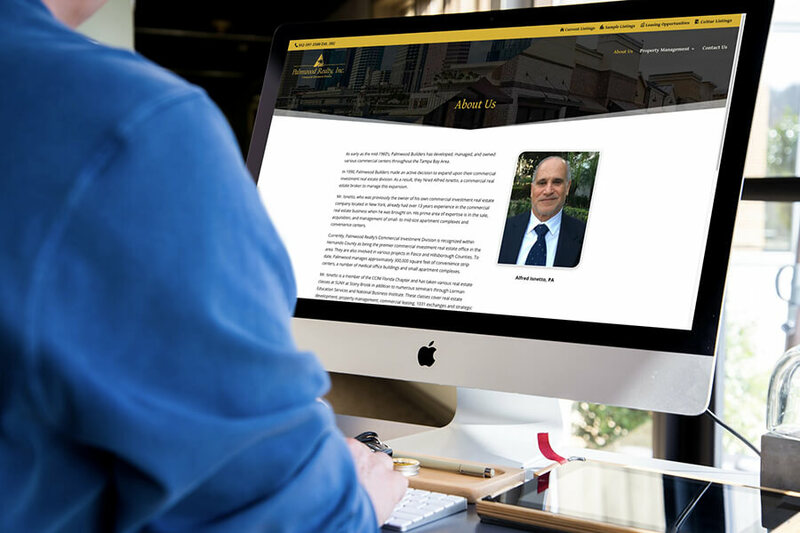 Because they are a commercial real estate agency that doesn’t rely too heavily on the MLS (multiple listing service) systems for their properties, like a residential real estate agency might use, a site needed to be built that fit their business model, as well as their clients’ needs. 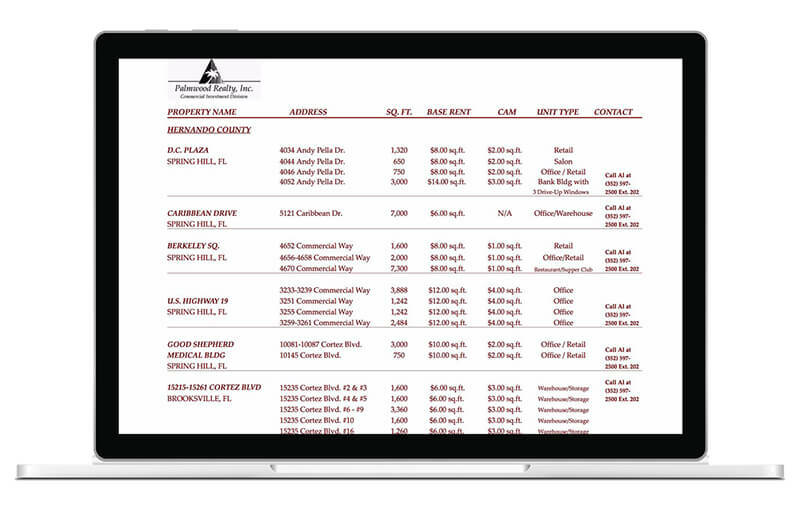 While an integrated and searchable database of the properties they lease was proposed and initially built for them on our end, they opted instead for a PDF solution that their clients could easily download and print on standard size paper. They felt this solution worked best for their particular niche and needs. They did have a printable solution on their old site that their clients were used to, however, it opened on a separate page, apart from their website, and was not branded to their company at all. It also wasn’t properly formatted to print evenly on standard 8.5″ x 11″ paper. 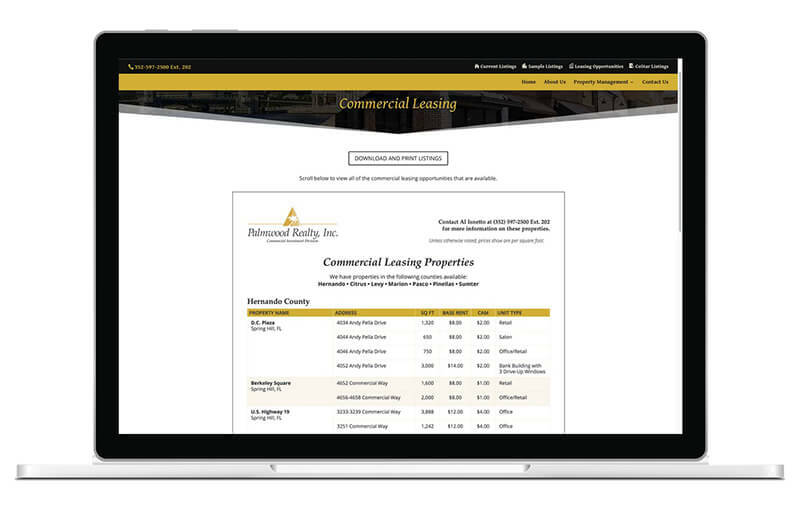 We built a branded sales sheet of their leasing properties in Adobe InDesign, exported it as a PDF file, and then embedded that PDF directly on their website, so it was “wrapped” in their company branding and clients are no longer taken “off-site” to view it. A download and print button allows their client to easily get a copy of that document for their needs offline. Similar solutions were also created for their sales division of the company, to highlight not only commercial properties they were already representing for sale, but also what they could do in terms of offering the best real estate services for clients who were looking to sell their properties as well. 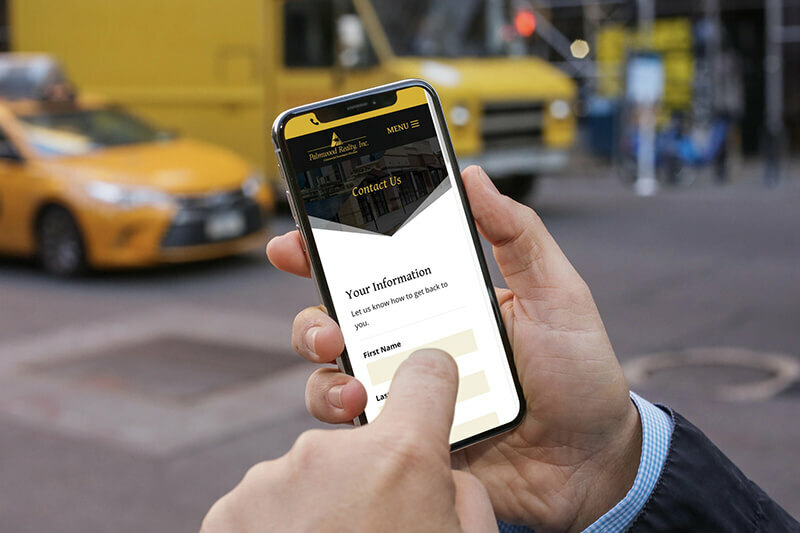 A contact form was created to allow clients and potential clients to contact them easily, whether from a desktop or on-the-go using their smartphones. Their contact form also features a backend logging system for backup copies, for safekeeping, of all contact form submissions. We were able to design, develop, and deploy a website in our website hosting environment, in just a couple of weeks, that met their goals. Working in WordPress, with the Divi framework, enabled us to give them a custom site that didn’t rely on off-the-shelf WordPress templates. Instead, we were able to completely match their website to their current branding for a consistent presentation to potential clients. Divi isn’t really a pre-designed WordPress theme, but more of a framework for building a custom website, while still having all the benefits of it being a WordPress CMS site. Because of the way it is structured, Divi gives a website designer, and expert Divi designers and developers, such as us, much more freedom to create a truly customized product for their clients. It’s custom WordPress design on steroids. Their new website will now be able to grow with their needs in the future. 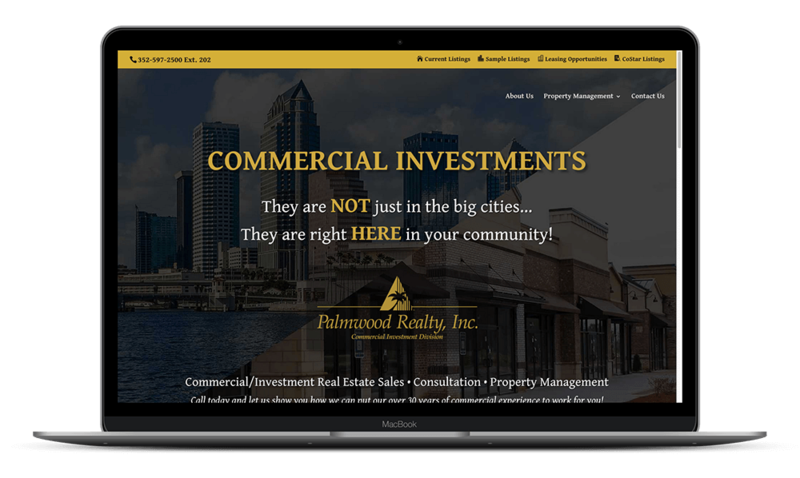 It will give them the ability to create landing pages and click funnels, and other functionality they may need when the time comes, making it a great start for Palmwood Commercial Realty’s updated and more modern online presence. The client also made the smart decision to pick a package that included both website hosting and one of our WordPress Maintenance and Support plans. This will ensure that their website has updated software at all times in the backend, is locked down and secure from hackers (as much as any site can be), and is backed up on a regular basis in case the worst happens, which translates to peace of mind moving forward for them.